It seems I am frequently posting about new photographic toys so I thought I would share something a little different today. As some may already know, Kim and I have been tackling the rebuilding of our front fireplace hearth and mantle for some time. Kim built up the mantle using brick and mortar and we decided to use marble tiles for the hearth. Rather than rent a wet saw we decided to purchase one as it would be useful for cutting other tiles (like bathrooms, kitchens and even landscape tiles). It was my first time assembling and using a wet saw. Its basically a saw with a tray below full of water. A water pump draws water and pours it over the blade as it cuts. 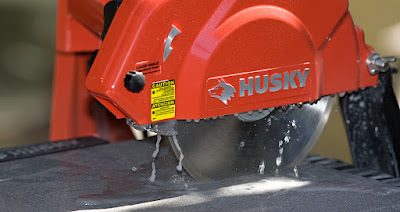 This ensures a very smooth cut and keeps the blade from overheating. Technical Specs: Canon 5D, 300 f/4 IS, f/5.6, 1/200s, ISO 200.